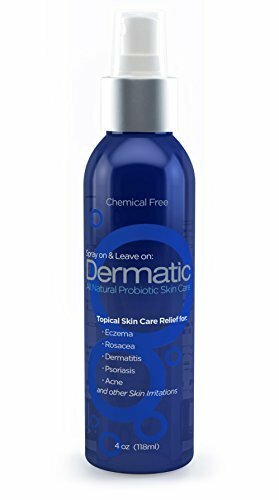 Dermatic Topical Probiotic is said to provide relief from eczema, rosacea, dermatitis, acne and other skin conditions. The formula contains no chemicals or alcohol and provides 100 mln CFU’S of probiotics. Probiotics can be defined as live microbial dietary supplements that have beneficial effects on humans, improving and curing the internal microbial balance. The impact of probiotic bacteria is extremely difficult to explain only through the current scientific data and observations, taking into account the presence of billions of bacteria in the human bacterial ecosystem. Nevertheless, their influence on human physiology is immense and continues to be subject to more observations and new scientific facts. Each bottle contains 4 oz (118 ml) product. SIMPLY SPRAY AND LEAVE ON - Works for up to 3 days in helping remove bad bacteria from the skin. 1 What are the pros and cons of Dermatic? 4 Does Dermatic really work? 6 How to apply Dermatic? 7 How much does Dermatic cost? What are the pros and cons of Dermatic? This is a very popular product for seborrheic dermatitis treatment. However, the reviews are not very impressive. The formula uses no chemicals or alcohol to ensure no nasty smells or stinging on the skin. It is probiotic-based, containing 100 mln CFU, which helps clean the skin at the microscopic level to aid in the removal of bacteria that cause irritation. We highly recommend trying a sample of Dermatic before purchasing this particular treatment in order to check whether it will be appropriate for your skin type. It may seem paradoxical, but there are people who have rashes, due to probiotic treatment (having that probiotics purpose is to prevent allergic reactions). Lactobacillus rhamnosus – a bacteria that usually exists in the body, primarily in the intestines. It has been used as a probiotic, or “friendly bacteria,” to prevent the growth of harmful bacteria in the stomach and intestines when taken orally. When applied topically, Lactobacillus rhamnosus can inhibit Staphylococcus aureus infection of human primary keratinocytes in culture. To date, there is no clear information on the causes and mechanisms of development of seborrhoea in humans. The comments about this product are extremely controversial. Dermatic’s Online performance is below the average, there are multiple customers who did not experience positive results after using the product. It relieved my itching almost instantly. It’s not tacky and it dries quickly leaving my skin smooth. This product is the only thing that is ever calmed my skin down. after one use I could see a difference and after a week my skin looks and feels fantastic. I ended up tossing it after a couple weeks because it was burning my skin. The directions suggest applying the product directly to any dry skin surface. You should spray on the skin and do not wipe off or remove. Dermatic Topical Probiotic can be applied 1-2 times daily for best results. The product is safe for eyes, ears, and face. How much does Dermatic cost? The price of the product is below $20 but is considered high, having that most of the customers did not obtain the results expected. I have had a problem with regular and repeated peeling skin on my hands that was diagnosed as a form of eczema. I have been using this spray on my hands for three weeks and have not had another episode of peeling skin. It starts, but the spray immediately “heals” the areas that are beginning to peel. Unfortunately, Amazon is out of stock and is not providing a date when the product may be available again. I’m searching for a refill !